Products eligible to exhibit within this category are non-horticultural products that are inspired by the garden or horticulture. These products can be large or small value items, tea towels to jewellery. There is a range of sizes available, but all exhibits are under cover. Specialist products, such as botanical art and photography, are included within this category. The fabulous Country Living Magazine Pavilions at RHS Malvern Spring Festival, RHS Hampton Court Palace Garden Festival and RHS Flower Show Tatton Park provide a treasure trove of desirable products for the home. *Please note: all non-horticultural products for Chelsea must be a range inspired by horticulture, this category makes up only 15% of the tradestands so is highly oversubscribed. Exhibiting at another RHS show first and providing images of your excellent stand design and horticulturally inspired products are ideal supporting documents for your Chelsea application. RHS London Show tradestands are encouraged to display horticultural related products as much as possible, all applicants should apply using the form on the Horticultural/Garden Products page. For more information please contact Exhibitor applications. If you are interested in exhibiting Botanical Art please contact the Picture committee with examples of your work. If you have been approved by the picture panel and are within the five-year period, and you have an enquiry regarding applying for the shows in 2019, please contact Exhibitor applications. If you are interested in exhibiting at the Craft Market please contact Craft Folk via their website. RHS Malvern Spring Festival: For more information on tradestand applications please contact Steve Allsop at the RHS Malvern Spring Festival. 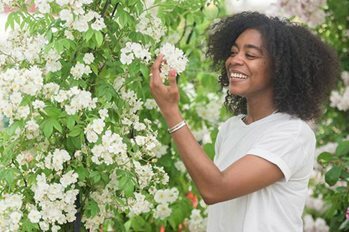 RHS Chelsea Flower Show: Applications for RHS Chelsea Flower Show 2019 are available via the Horticultural Products page. For more information please contact Tradestands. RHS Chatsworth Flower Show: There is an area of the show dedicated to lifestyle products such as clothing, homewares, artwork and jewellery. If you would like to apply to exhibit a design-led lifestyle product celebrating modern or heritage design, please follow the links below. RHS Hampton Court Palace Garden Festival: Country Living Magazine Pavilion - If you are interested in exhibiting with the Country Living Magazine Pavilion please contact Louise Duckett. RHS Flower Show Tatton Park: There will be an area of the show dedicated to products and contemporary crafts that are horticultural or botanically related such as textiles, ceramics, woodwork and artwork. If you would like to apply to exhibit a botanical design product, please follow the links below. All other lifestyle products without a botanical or horticultural influence will be housed within the Country Living Magazine Pavilion. If you are interested in exhibiting in the pavilion please contact Louise Duckett. Malvern Autumn Show: For more information on tradestand applications please contact Steve Allsop at the Malvern Autumn Show. If you are interested in exhibiting at the RHS Hyde Hall Flower Show contact Hyde Hall events or call 01245 402013. If you are interested in exhibiting at the RHS Wisley Flower Show contact Wisley events or call 01483 226508. If you are interested in exhibiting at the RHS Harlow Carr Flower Show please request an application form by contacting Harlow Carr events or by calling 01423 724 647. If you are interested in exhibiting at the RHS Rosemoor Flower Show contact Rosemoor events or call 01805 626800. Applications for the 2019 RHS Flower Shows will be available throughout the year. For enquiries not covered in our Exhibit at a Show pages please email the Exhibitor Applications team quoting the show(s) you are interested in and providing information about your product.